RSL notes • Coasta Rican striker has suffered through an injury-plagued year. Chris Detrick | The Salt Lake Tribune Real Salt Lake forward Alvaro Saborio (15) reacts after missing a shot on goal during the second half of the Major League Soccer playoff game at Rio Tinto Stadium Thursday November 8, 2012. Seattle won the game 1-0. Sandy • Alvaro Saborio was not with his Real Salt Lake teammates as they returned to the practice field under a gray sky Tuesday morning. The Costa Rican striker had expected to play for his country this week against Jamaica, but instead he arrived back in Salt Lake City late Monday after suffering a calf strain. The 31-year-old Saborio had been dealing with a similar injury on his right leg before leaving for Costa Rica last week, but RSL coach Jason Kreis said Saborio has injured the left leg. "It&apos;s a little bit of an odd year for Sabo because he&apos;s had so many muscle injuries," Kreis said. "We know historically he&apos;s had some knee problems, but really the knee has gotten along very nicely this year. It&apos;s been muscles." 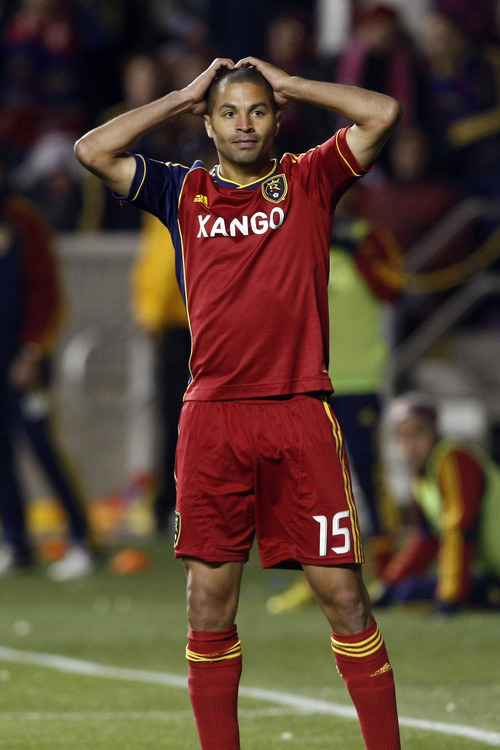 Saborio has only played in 13 of RSL&apos;s 28 league games this season. Even with limited time on the field, the team&apos;s all-time leading goal scorer has made an impact, notching a team-best 10 goals this year. In another year, Kreis said he may have been willing to talk with Saborio about missing national team action. But with a chance to help get his country to the World Cup in Brazil next year, the RSL coach said there is too much on the line to ask that of his striker. "I think you can have those kinds of conversations and thinking when they&apos;re not World Cup qualifiers," he said. "But when it&apos;s a World Cup qualifier, I think it&apos;s just too important of an occasion. He&apos;s a leader on that team. He&apos;s worn the captain&apos;s armband on several occasions. He wants to represent his country the right way … and lead through actions." Kyle Beckerman and Nick Rimando have been regular call-ups to the U.S. men&apos;s national team in recent years. But as the team prepared for a qualifying showdown with Mexico this week, another member of RSL got the nod. Assistant coach Jeff Cassar was in Columbus helping Jurgen Klinsmann&apos;s team as the goalkeepers&apos; coach. "It&apos;s not very often that you get a national team call-up for your coach," Kreis said. "But their goalkeeping coach had some type of surgery and wasn&apos;t able to make it over. … Any time you can help your country qualify for a World Cup, you take that opportunity." Midfielder Ned Grabavoy played with a cast on his left hand Tuesday after suffering a broken bone last week in the win over Portland. "Obviously it&apos;s better a hand than a foot," he said. "So I guess you have to look at the positives."